Setting up hardware consists of connecting cluster nodes to other hardware required to run the Red Hat High Availability Add-On. The amount and type of hardware varies according to the purpose and availability requirements of the cluster. Typically, an enterprise-level cluster requires the following type of hardware (see Figure 1.1, “Red Hat High Availability Add-On Hardware Overview”). For considerations about hardware and other cluster configuration concerns, see Chapter 3, Before Configuring the Red Hat High Availability Add-On or check with an authorized Red Hat representative. Cluster nodes — Computers that are capable of running Red Hat Enterprise Linux 6 software, with at least 1GB of RAM. 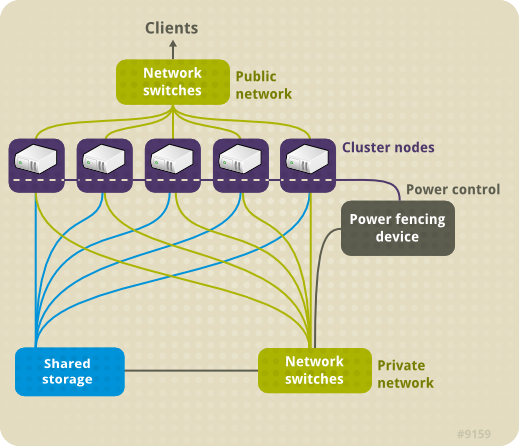 Network switches for public network — This is required for client access to the cluster. Network switches for private network — This is required for communication among the cluster nodes and other cluster hardware such as network power switches and Fibre Channel switches. Fencing device — A fencing device is required. A network power switch is recommended to perform fencing in an enterprise-level cluster. For information about supported fencing devices, see Appendix A, Fence Device Parameters. Storage — Some type of storage is required for a cluster. Figure 1.1, “Red Hat High Availability Add-On Hardware Overview” shows shared storage, but shared storage may not be required for your specific use.